This is a gorgeous blade putter. It has that Tuscan nickel finish giving it a sleek look like a sports car. It has nice alignment aid -- a line drawn on the scooped-out blade. The best thing about it is TaylorMade's insert featuring 14 grooves positioned closer together, promoting better touch and more efficient spin for a smoother roll. I like this putter, but it reminds me of a putter I like even better: the Odyssey White Hot Tour #2 Putter. I like the Odyssey better because of the sole weighting. It has "tour-tuned" weight ports in the sole, which Odyssey uses to optimize the weight proportionally to the shaft length. The putter has an exceptional balance and feel. In addition, the insert that Odyssey uses in their White Hot Tour line is more responsive than the TaylorMade insert with the 14 grooves. 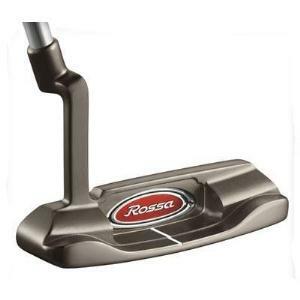 The price for both putters is comparable, and both putters are of tour quality and have a sleek look at set up. I would recommend these putters for the low handicap golfers that prefer blade putters and can appreciate a responsive insert.